Hello there and welcome to another day of Clearly Besotted teasers. Today is all about Christmas for me. I have to admit it, I am one of those crafters who usually makes their Christmas cards in December! Clearly Besotted are releasing three Christmas stamp sets this month, I am using two of them today. 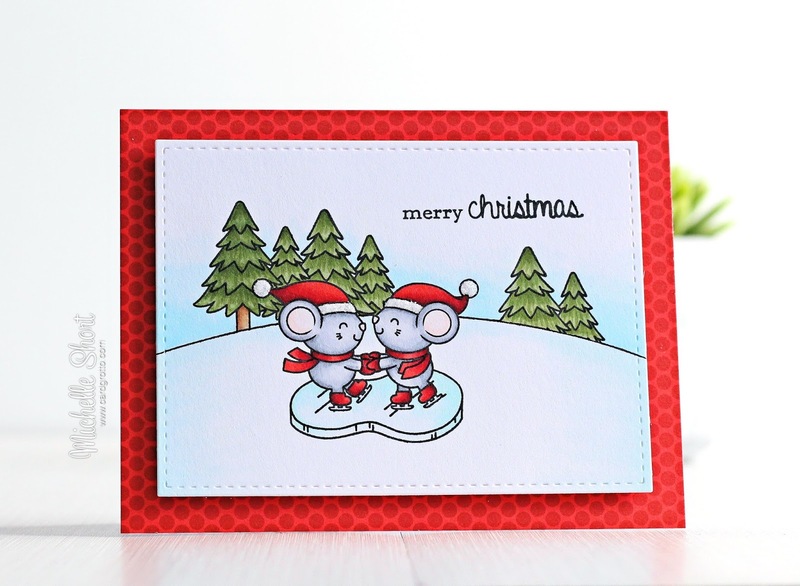 My card today uses the new adorable On Thin Ice stamp set. I started off by cutting a panel of white cardstock using the ME Femme Frames rectangle die. I then stamped the mice, ice, trees and sentiment using black ink. I masked off the various stamps as I went along so that I could make a scene. I then free-hand drew in the snow bank with a black pen. The whole image was coloured using Copic Markers. I took a white A2 card base and added a sheet of paper from the Doodlebug Kraft In Colour - Colour paper pad to the front. The image panel was then adhered on top with foam tape. To finish off, I added a small amount of Quickie Glue pen to the mice's hats and sprinkled over Ice White Nuvo Glitter on to them. COPIC MARKERS: Mice - C5, C3, C2, C1, R00, R000. Hats, gloves and skates - R89, R37, R29, R27, R24. Ice - BG11, BG000, BG0000. Trees - YG67, YG63, E57, E55. Snow - BG000, BG0000, BG10, 0. Sky - B00, B000, B0000, 0. I am also using the wonderful new Let's Prance stamp set today. It is one of the smaller sets and I just love the reindeer in it. 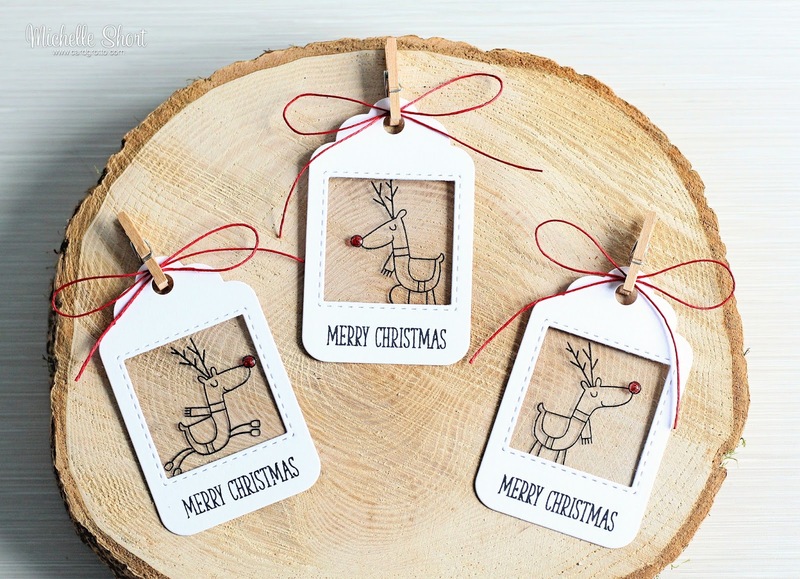 I have used it to make some Christmas tags. I started off by cutting the CB Rounded Tag die (sadly retired) from white cardstock. I then took a SSS Stitched Square die and cut the centres from the tags. I stamped the sentiment, from the CB Many Mini Messages set, on to the bottom of the tags with black ink. 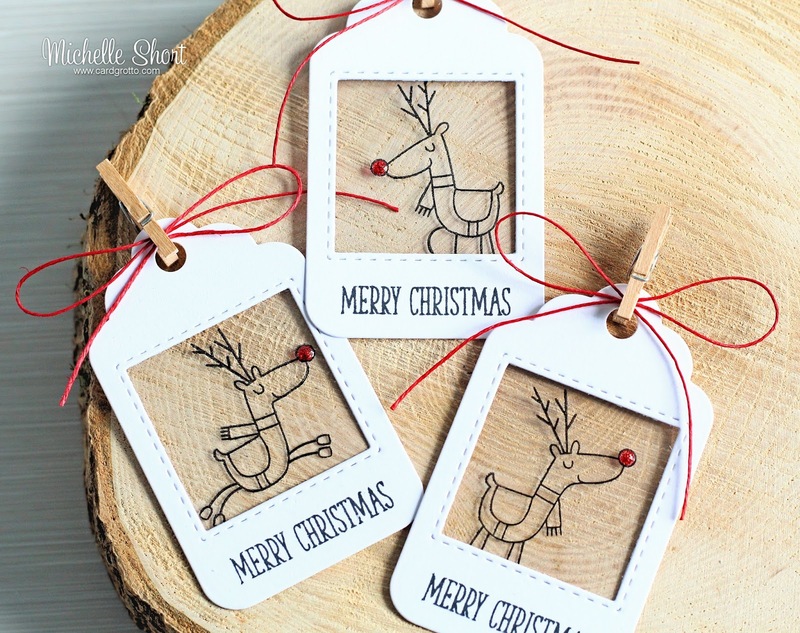 I then took the three reindeer images and stamped these on to acetate using black Stazon ink. These were added to the back side of the tags. I added Ruby Slippers Crystal Nuvo Drops on to the reindeer's noses. I then took a red R29 Copic Marker and coloured some hemp cord with it. Once dry these were tied in bows and adhered to the tags with mini clothes pins. I had so much fun making these samples for today! I do hope you will head over and see Stephanie. She will have some fabulous cards to share with you, along with links to the rest of the DT sharing today. Thanks so much for visiting me today, see you tomorrow! Cute card and love the tags! Oh my! Those skating mice are too cute!! And I love your reindeer tags! Super!!! So sweet....so in love with your tags! Your card is so adorable! I also love the tags. What a great idea to use acetate! I never would have thought of that! 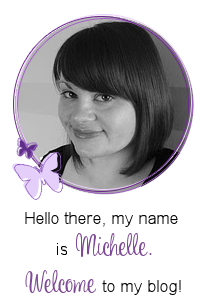 Hi Michelle, I really need some tips for stamping the Stazon on acetate. Mine won't come out clear ! I found the best way to do it was to only press down slightly. Just so that the ink goes on the acetate, if I pressed too hard, like I would when normally stamping, I didn't get a good impression. I hope that helps! OMG! Your clear tags are A-MAZING! Michelle, do you remember how big the tags themselves were and what size square punch you used. I'm starting my Christmas craft gathering and I like having all the supplies ready to use. Hi Hope, the tag is approx. 3.4 cm x 2 cm and the square dies is approx. 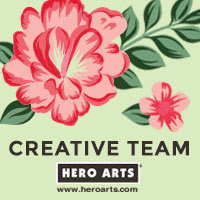 3.7 cm x 3.7 cm. I hope that helps :) Sorry for the delay in replying.